Taste testers are worth their weight in gold around our home. Taste testers that will also write about what they tasted, even more better! This super easy Beer Braised Chicken Recipe was prepared for my resident taste testers, and Randy, the head taste tester, is here to share all about it. Take it away, Randy! 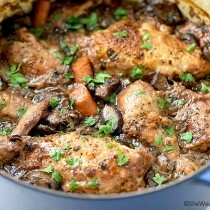 This Beer Braised Chicken Recipe couldn’t be easier and is perfect for any weeknight meal. It can be prepared and cooked in a little over 30 minutes. Dinnertime is not only a time of fellowship, but nourishment, and call me crazy, but I want it to taste good. With current food costs so durn much, I want to make the most of it, but sometimes it feels like you have to be a lottery winner to pay the grocery bill. With the sticker shock at the meat counter, it’s tempting to just bypass it altogether and try to figure out something else for dinner. But, there is no substitute for preparing real food from scratch for flavor and nutrition and budget friendliness. This Beer Braised Chicken checks all the boxes. The flavor is fantastic and it’s as easy as can be. You might have enjoyed beer-can chicken before. That’s the one where a whole chicken is roasted on top of a beer can on the grill or in the oven. 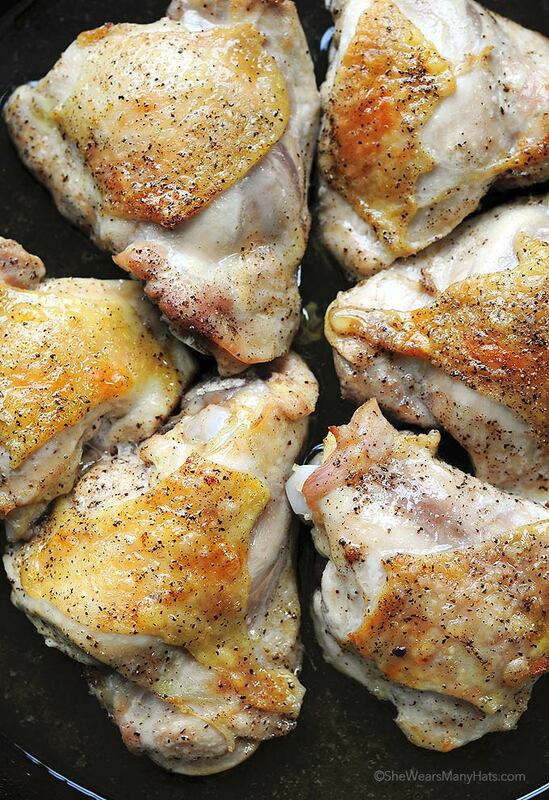 Beer Braised Chicken is the same general flavor profile but there are a couple advantages. First of all you can choose which chicken parts to cook instead of having to cook the whole thing. Secondly, beer roasted chicken is never dry. Yes, flavorful and juicy. And no, surprisingly it does NOT have a strong beer flavor. This roasted chicken is well-seasoned and not dry. Really good. Really easy. A real winner. Speaking of costs, chicken thighs are perfect for this recipe. Thighs in my humble opinion are the tastiest parts of the bird and thankfully they’re usually the least expensive parts too. Often our local market often has thighs or leg quarters on sale for a fraction of what boneless breasts of tenderloins cost. And while we’re on the topic of chicken, I am a big believer that the most tender and juicy chickens are the smaller ones. It seems like every time I go the market the birds available for purchase are getting bigger and bigger, and we find that they just don’t taste all that good and the texture is usually tough too. So we always try to find the smaller of the offerings. 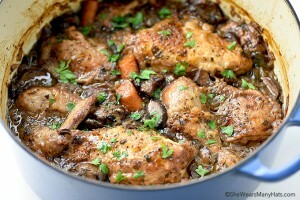 This Beer Braised Chicken Recipe is one to try real soon. It’ll will be done in no time and disappear just as quick. Enjoy! Be sure to check out this Balsamic Beer Braised Pork Roast Recipe for another easy way to utilize the flavor of beer when braising meat. 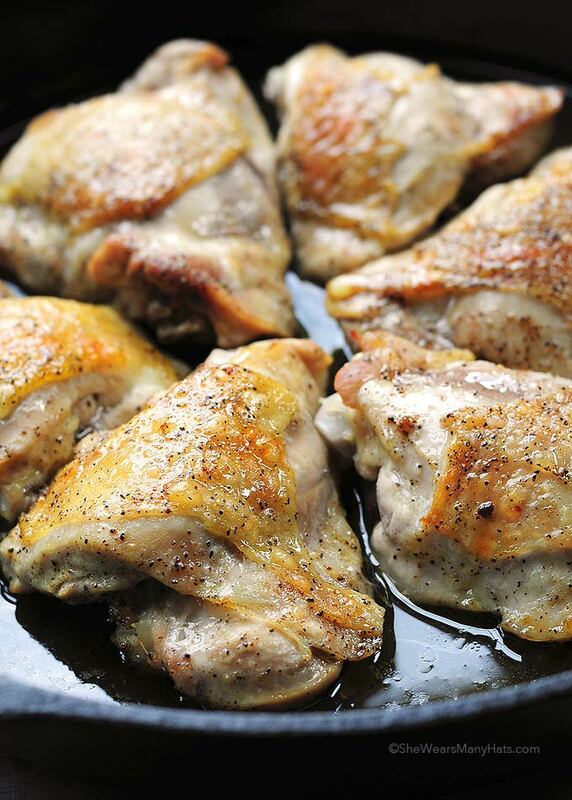 This quick and easy chicken is so full of flavor and never dry. It's really the perfect recipe for any weeknight meal. 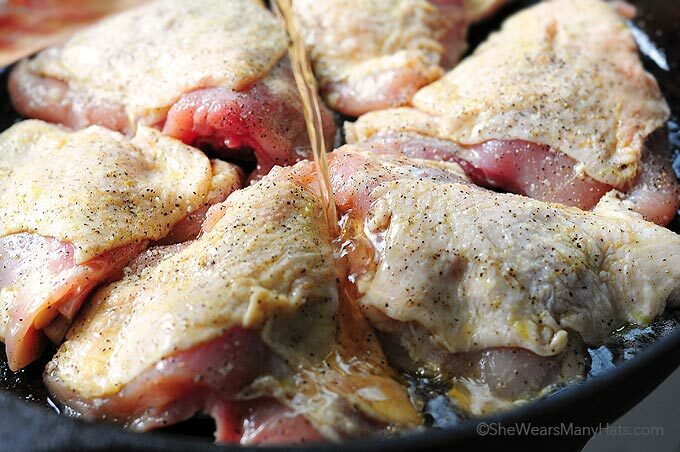 Add olive oil to bottom of an iron or oven-proof skillet or dutch oven. Coat chicken with olive oil, generously sprinkle with salt and pepper on all sides. Whisk together beer and brown sugar, and pour over chicken. Bake uncovered 30 minutes, or until chicken is done. Randy you’ve certainly convinced me that we need to bring these Beer Braised Chicken in our Buffalo home real soon! 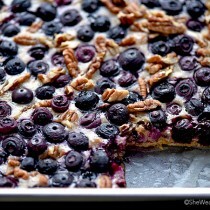 Headed to the grocery store now… I gotta make this asap!! What’s that saying? “winner winner chicken dinner!” This is wonderful! 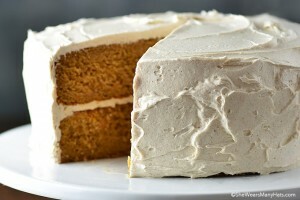 I’m so making this…SOON! I was wondering if skinless would work? 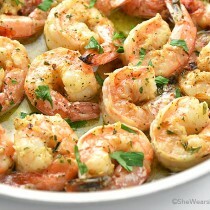 I am making this for dinner tonight and only have those on hand. Yes, but you may want to lightly tent it halfway through with foil to avoid it drying out. Tried this last night. Sautéed some onions and seared the chicken skin side down before popping it into the oven with the beer and sugar. While the chicken turned out moist, I found it much too sweet. Would probably try this again sans sugar. Great recipe all the same! Sauteed onions sound like a fantastic addition. Thanks for sharing, JC! 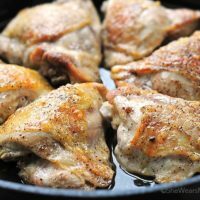 Do I need to coat the chicken with extra oil or just what’s in the pan? Just what’s in the pan. It was delicious, tender and I will be making it again. I like making dinner before leaving for work. My dinner was cooking while I got ready for work. Everyone can eat when they get home from work and eat healthy. 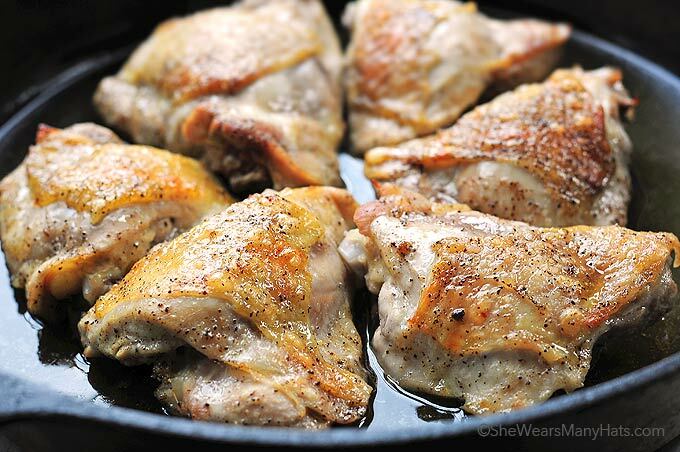 Thanks for share a quick, easy chicken recipe. I’m so glad you enjoyed it, Marilyn! Tried the recipe tonight for hubby’s birthday but modified it a bit. And they loved it! Before I baked the chicken, I marinated it first with beer and brown sugar mixture for at least an hour. . .Then I followed through the procedure. The aroma during the first 15 minutes smelled “delicious” already. I baked it for at least 40 minutes or just until the remaining liquid caramelized. The chicken was cooked through and was moist inside with a crispy skin on the outside. Will definitely make this again! Thanks! Sounds delicious! Glad you enjoyed it, Faith. I’ve written to you before and never received a reply regarding the print quality of your recipes! When they print out, the only part clear enough to read is the very top with the page # , name of the recipe and the very bottom with the date and the http address!! It’s not my printer as other websites print just fine….please check into this and would hope to receive a response this time from you!! Margie, I did reply to you before. Again, I’m not sure what to tell you as my recipes are formatted with a basic type that should have no problem when printing. Are you clicking on the small red “print recipe” to print out the recipe? I will definitely make this next time since I am on a low budget too. Sounds delicious! Made this last night with chicken drummies and Guiness Beer, it was great! Thanks!! Can I make this in a crock pot ? 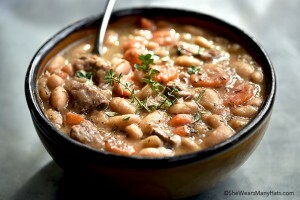 I’ve never cooked it in a crock pot, but I think it should work. Of course, the skin will not crisp up. 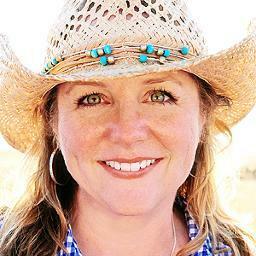 Amy – You are a terrific cook! Made the Chicken with Beer and love it. , but would like to make chicken soup using the pot. Any instruction on how long it will take to make the soup using chicken parts and veggies? Thank you.